Matera Italy is a place where style meets excellent weather for a good portion of the year, breathtaking landscape and rich history like no other. 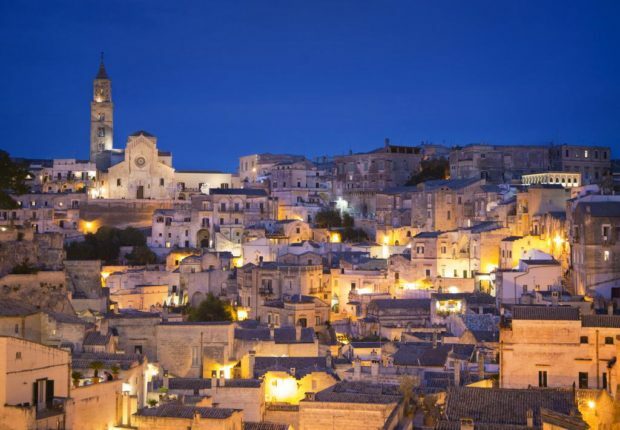 A visit to Matera is like walking into the past while enjoying the best of the modern accommodation and luxury. If you are looking for the best places to stay while exploring this town then here are some of the best hotels that you can stay. 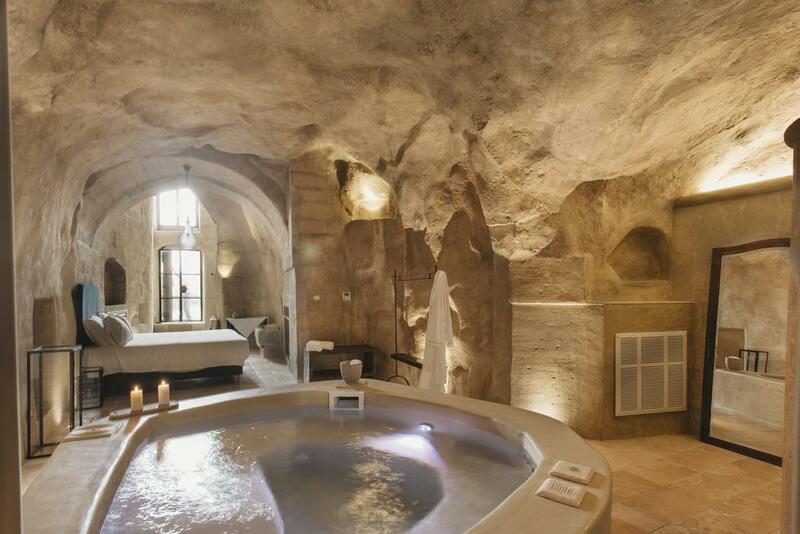 Sextantio Le Grotte Della Civita is located in the historic Apennine Village in Matera. The hotel is located on the oldest part of the dwellings and faces the spectacular rock-hewn churches and Murgia Park. The hotel offers rooms and suites set into caves, a massage room, excursions into the nearby scenic areas, seaside excursions as well as local wine tasting and Italian bread making courses. You can stay in any of their 18 elegantly furnished rooms all with a traditional touch. 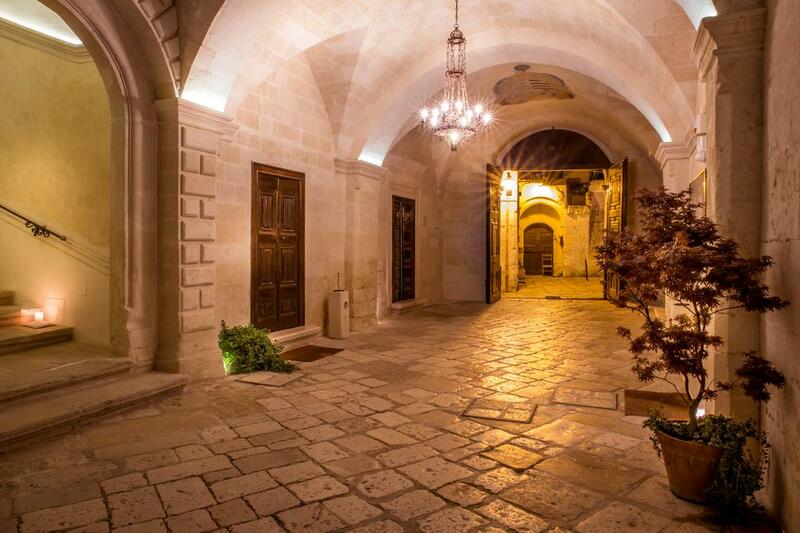 Palazzo Gattini is located on the highest point of Matera and provides a breathtaking view of the Sassi towns. The palace-like hotel enables you to enjoy a five-star experience in an incredibly historical location. The hotel is known for its attention to detail and serves cuisines from around the world. It has a roof garden with pool to relax in too. 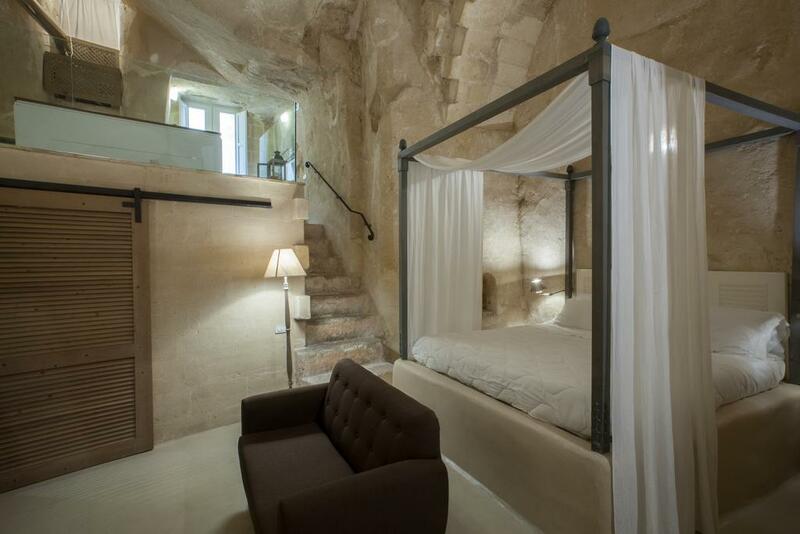 All rooms are cave rooms with incredible stone backrooms too. You can also take part in the hotel’s outdoor events package to enjoy the best of the surrounding historical town. 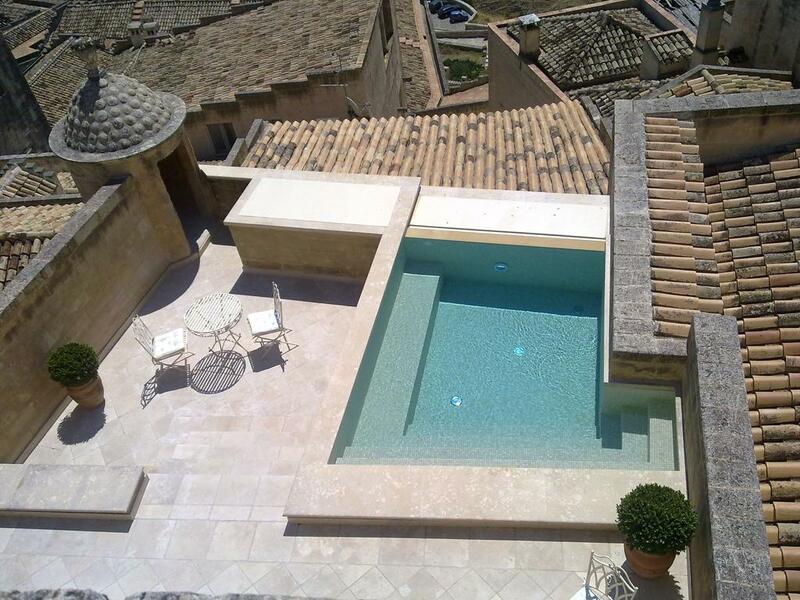 It is an excellent place for a stay in Matera. Located on the cave dwellings near the centre of Sasi di Matera, the family-run luxury hotel has been offering the best of Italian service since 2000. Its deluxe rooms and superior suites are located in an 18th Century Royal court building that was restored to give it a luxurious feel. You will still love its charming spaces and traditional feel. The restaurant offers the very best of the local cuisine with many dishes cooked in the traditional recipe. It has an outdoor parlour for outside lunch and dinner. 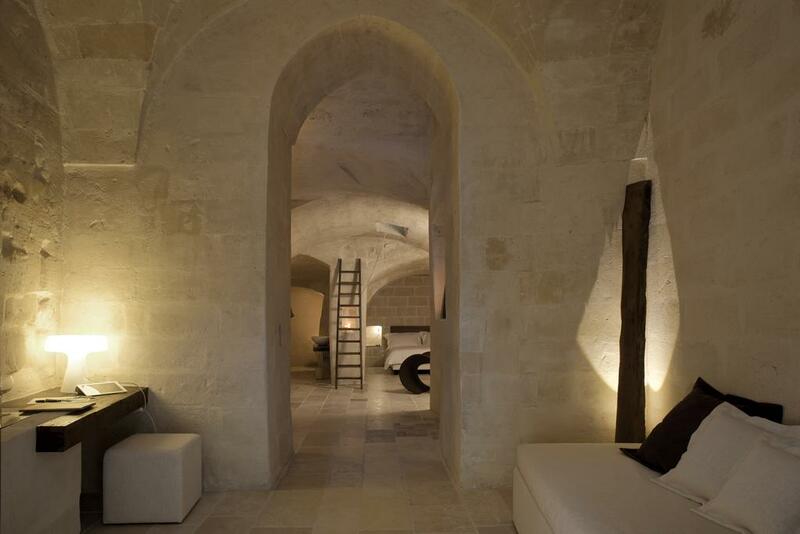 L’Hotel in Pietra is your luxurious boutique hotel in Sassi Matera. It is housed in a building that was a 1300’s church. You will feel a sense of deep spirituality with the historical charm in any of their en-suite rooms and restaurant. The hotel offers the very best of Italian and European cuisine, a Middle Ages like library and a terrace where you can have your lunch in the warm midday sun or dinner in the golden oars of the setting sun. Shaped like a well, Corte San Pietro offers you the very best of the traditional Roman architecture with a touch of luxury. Much of the furniture comes from restored objects with Materan cave walls, making up for much of the walls. 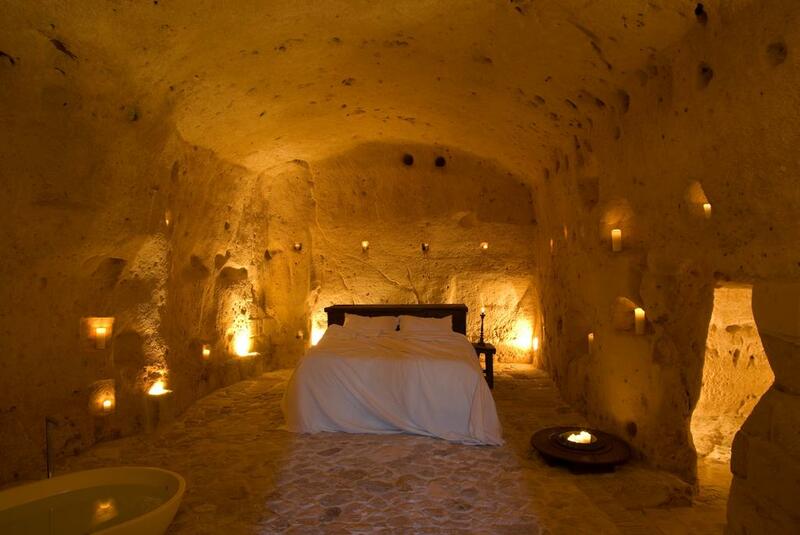 The hotel has a wide choice or carved rooms, including underground ones. It offers in-room massage, babysitting and can connect you with leading tour service providers in the area. It has a mouth-watering traditional breakfast with new visitors getting free fruit desserts on arrival. Palazzo Del Duca is housed in a restored palace in Sassi. It boasts of royalty like service that includes spacious, luxurious accommodation with attention to personal relaxation and general wellness. Room hallways and the restaurant are meticulously designed to give them a modern feel while preserving the rocky appearance. Enjoy delicious cuisines, in-room massage, cooking lessons and minibar, among others. This is a place to be for a relaxed Italian vacation or when you need to reset and restart your goals over again. 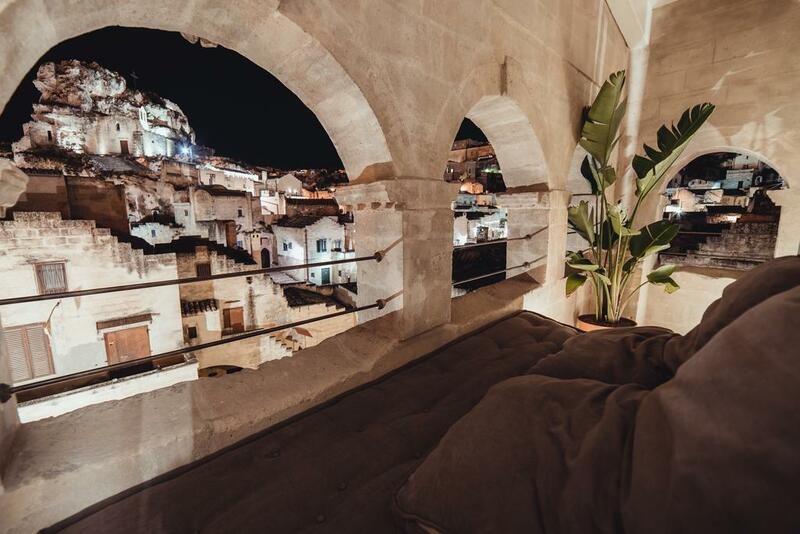 Located in a 17th century Italian Palace, Palazzo Viceconte Matera offers a kingly service while giving your awesome panoramic views of the historic Sassi and much of Matera. The magnificent hotel has spacious rooms and an excellent mix of cuisines that are fit for the kings. Couples get a weekend massage offer and a bottle of wine in the ‘Matera in Love’ offer. The palace is a great place to hold your weddings, special events, business meetings and conferences.